The billionaire did not make a single contribution to any of the not-for-profit groups that were formed in the wake of the terror attack to provide aid to survivors, rescue workers, or the families of cops and firemen who died trying to save others. Just as we reported a few months ago. After our story was published, Trump campaign spokesperson Hope Hicks told the Daily Mail that the billionaire donated more than half a million dollars to “organizations as a result of the 9/11 tragedy.” She then cited $500,000 in donations made to the United Way of New York City, and unspecified contributions to the American Red Cross and the Marine Corps Law Enforcement Fund. As we have reported for 15 years, Trump’s pitiful philanthropy trickles through the Donald J. Trump Foundation. A review of the group’s IRS returns shows that the organization gave $250,000 to the United Way in both 2004 and 2006--three and five years, respectively, after the Twin Towers collapsed. In the days after the terror attack, the United Way of New York teamed with The New York Community Trust to form the September 11th Fund, which raised more than $500 million before it stopped accepting donations in January 2002 (the fund closed at the end of 2004 after giving away its last dollar). More than two million individuals, businesses, and foundations were moved to donate to the United Way's September 11th Fund in the four months after Osama bin Laden’s disciples struck. But Donald Trump was not among that group. 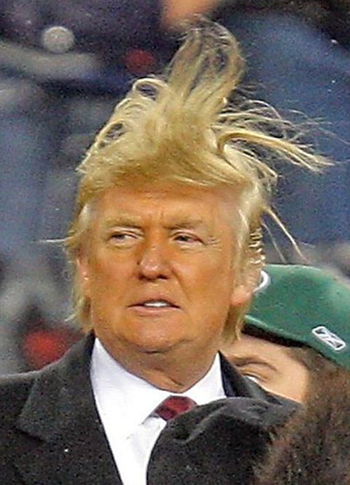 Trump’s spokesperson also cited the Republican presidential candidate’s donations to the American Red Cross. But the Trump tax returns show that the foundation only began giving to the Red Cross in 2008, with the group’s largest donation, $100,000, coming in 2010. In 2013, Trump gave $5000 to the Marine Corps-Law Enforcement Foundation, which is not a September 11 charity. The group says it provides scholarships to “every child who loses a parent serving in the Marine Corps” or a federal law enforcement agency. 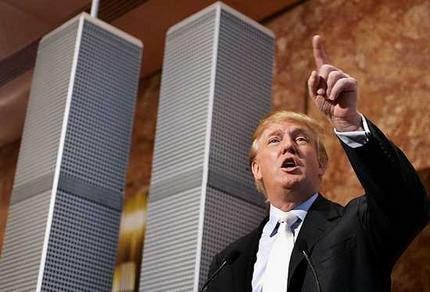 The Republican presidential candidate, a son of New York City, claims he watched with his own eyes as victims jumped to their death from the upper floors of the World Trade Center. Trump has said he saw this horror unfold from his Fifth Avenue penthouse, five miles north of the attack site. So perhaps he was too traumatized to even search for his checkbook in the weeks after 2753 individuals perished in lower Manhattan. But what makes Trump’s cold shoulder to September 11 victims and their families even more galling is the fact that the tycoon put his hand out when government officials offered recovery money to small companies affected by the attacks. As reported by the New York Daily News in January 2006, the Trump firm that owns the office tower at 40 Wall Street applied for a grant from the Empire State Development Corporation (ESDC), the New York state agency that distributed federal money earmarked for small businesses. Trump’s company received a $150,000 check to cover losses incurred at the 72-story building, which is several blocks east of the World Trade Center site. The News reported that Trump got the six-figure handout because the ESDC “ignored the federal definition of a small business and adopted a much looser standard” when it came to approving grants.